March 09: Every day this month, we’re highlighting a free music podcast – for 31 Days of Free Music. It’s all stuff that you’re not likely to hear on mainstream radio – so get ready to free your ears! Have you recovered from yesterday’s barrage of FCC-banned music? If so, maybe you’re ready for some hip-hop that you’re not likely to hear on the radio. 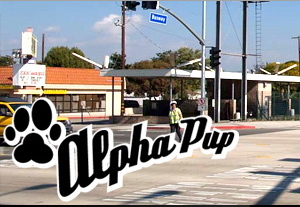 Los Angeles-based indie recording label Alpha Pup Records publishes the Alternative Hip-Hop Lounge podcast. Billing themselves as “the freshest DJ-mixed podcast on the planet,” the show features music ranging from avant-garde rap to cutting edge turntablism and experimental electronica. Each month’s podcast is mixed by a different DJ or underground hip-hop producer.